A lost dog is providing opportunity for Grace Brethren missionaries Kevin and Holly High to meet some of their new neighbors in northern Argentina. The Highs have recently moved to a new area, and the following is excerpted from one of their updates. “We’ve been in the midst of a type of family crisis since last Friday night when our two boxer puppies, seven months old, escaped after dark from our home. They have been part of the family since March and are brother and sister, Spike and Samantha. 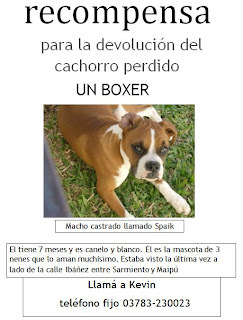 “In Argentina, this is something that both the police nor the SPCA helps with and the rule of finders-keepers is legal. “On Monday, around lunchtime we recovered Samantha about five miles away in a dark mechanic’s shop inside the cab of a wrecked pickup truck. She was dehydrated and weak but is making a good recovery at home. It is a miracle of the direct intervention of God’s mighty hand that led us to find her.